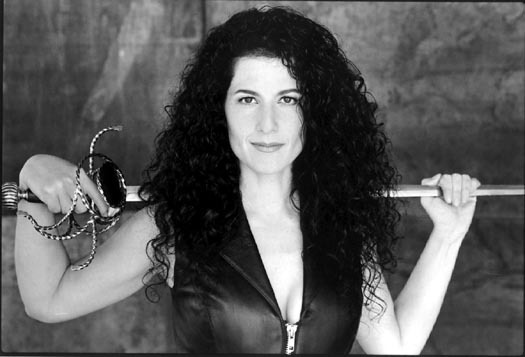 Roberta Brown is a sword instructor at the Westside Fencing Center. LW> How did you decide that you wanted to study sword choreography and how long have you been doing it? I've been a sword choreographer for nearly 15 years. 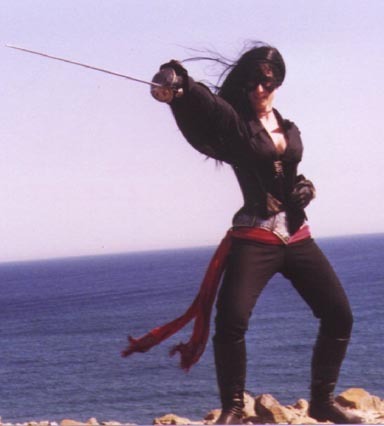 I first entered the sword world as a fencer, so when, as part of my MFA in acting, stage combat and theatrical fencing came up, I found that I really took to it. In those days the Society of British Fight Directors had a series of exams, at least one of which all British actors had to face during their training, and most people would finish drama school with a basic certification in stage combat (no doubt why so many British actors are adept in swordplay!) I ended up passing all of the exams while my classmates prepared for their first, mostly because I had that head start. And of course, because I found that I loved it. I decided that this was what I wanted to develop as my 'day job' as it were, and I have been very fortunate that the plan worked! LW> When did you first become partnered with Robert Chapin? Bob and I met within a week of my moving to Los Angeles - he was one of the first friends I made in town. I was fortunate enough to be hired as a stage combat teacher at Westside Fencing Center my first week in L.A., and at the time Bob had just finished "Ring of Steel" and was studying with a couple of teachers at Westside. We began working out together regularly, along with some other great people I met at that time, and little by little we started working on projects together. LW> Tell us about how "Wench Taming:101" came into being, and who's idea was it for you to "best" the Wench Tamer? LW> Some of the moves in that routine put Bob's "talents" to the test, if you catch my drift. Accuracy must be of specific importance! How many times have you performed the piece and have there ever been any slips? LW> You are small of stature, and yet you wield a sword with ease. What types of conditioning have you gone through to hone this ability and what would you recommend for other women to prepare them to do the same? Although I enjoy many physical activities and have at various times in my life been active in figure skating, riding, roller-blading, hiking, etc..., am not sure that there is any particular regimen which prepared me to wield a sword other than just wielding swords! I suppose the one common denominator in all of my chosen sports is that they all work the legs pretty well, and swordplay is certainly demanding on the leg muscles. You have to have a strong base that supports you effortlessly while you focus on your blade. For beginning students I think this is the hardest thing, and there's always a big breakthrough when the leg muscles catch up to the demands being placed on them. In general, however, I find that wielding a sword and/or cracking a bullwhip is the best preparation there is for wielding a sword and/or cracking a bullwhip. And my favorite thing about these activities is that they require so much thought and concentration that you barely notice after a while how much work the body is getting while the mind is focusing on the weapon. LW> You performed as stunt double for Tessie Santiago. Without giving too much > away, can you tell us about some of what you did? Were there a lot of fight scenes? I did have some fun surprises and challenges along the way though - working out a pitchfork fight was one of them, and living out every girl's adolescent fantasy by getting to BE Bo Derek for a day was definitely another! 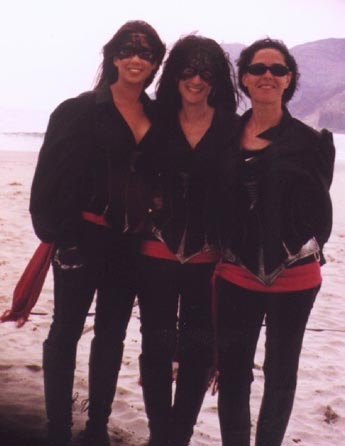 LW> What fun behind-the-scenes tales can you tell us about working on the QoS set. to teach me! Ricardo, Natalie Guijarro, and the rest of the team can do anything, and they're all willing to share and teach. This meant that whenever I had an hour free, it was OK to ask for a horse to play with. I think the horse story for which I became most famous was the day I took off alone on Guerrillero - Spanish for terrorist. When we were about a mile or two from the stables, he suddenly dropped to the ground and lay on his side.. It seems no one is immune! done as a 15 foot or so jump onto a big pad. Unfortunately, although Chencho is a great double for Peter from behind, his face looks nothing like Peter, so they couldn't get the shot Brian had hoped for. That's when Peter volunteered to do the jump himself. Let me just point out that jumping off of cliff faces is one of those stunts that actors never offer to do themselves!! But Peter climbed up and startled us all not just by doing it, but by doing the move like a professional stunt man, jumping face down into the pad and tucking at the very last second - a very difficult thing to do! LW> What other ongoing projects are you involved with ~ such as teaching, lecturing, writing? My main ongoing teaching venue is the Westside Fencing Center in L.A., though I also teach periodically at The Lee Strasberg Theatre Institute, the University of Southern California, the Howard Fine Studio, and West L.A College. Lecturing I just do to anyone who stands still long enough. As far as writing projects, I just this summer contributed to a book on women in fencing, I sold a film script last year which was an adaptation of the novel "Fanny Hill," and I am working on one or two other scripts at the moment. LW> Besides Sword Spectacular, what other conventions have you attended, or do you plan to attend? Literally the week that I returned from Spain, I was invited to William Campbell's Fantasticon, which was a great welcome home. At the moment I don't have any specific conventions in my plans, but my representatives at Holzheimer's are always coming up with fun things for me to do! LW> What other projects can we see you in? LW> What was it like shooting in Spain? Was it more difficult than lets say a US shoot? Language barriers - that sort of thing? bilingual people were hired, but on the first day of shooting there were about four of us who spoke Spanish and English (the main languages of the shoot), which led to moments like the director shouting, "Go! Go! Why doesn't she go?!" until someone pointed out, "Because she doesn't speak English..."
There was a really great attitude on the set, though, and the Spanish are truly delightful to work with. And of course all of us non-Spaniards were on an adventure, learning all the time -- culture, language, countryside, food, customs -- all of it was new, and fun, and exciting; and it made for a wonderful camaraderie as we explored together in our (occasional) time off. Of course, the other big challenge was the heat. No day went by without a conversation which went something to the tune of, "Oh, it's hot." To which the local would reply, "This isn't hot. You wait until it gets hot." It became my morning ritual to ask the driver, "Is it hot yet?" until finally, one day at the end of June, one of the drivers conceded, "Sí, hoy hace calor..."
LW> What was it like to work with Valentine Pelka? Valentine and I were able to take our fights to a different level, because we both already knew what we were doing and trusted each other to be safe, which gave us the freedom to make choices of style and dramatic effect and interpretation that weren't always possible with the less sword literate. This is of course when a sword fight becomes the most fun for me! I can't say enough good things about working with Valentine. LW> Did you spend a lot of time with Tessie to prepare for your doubling? sword. I taught her her first ever piece of sword choreography, and she was just terrific. David then very kindly began his campaign to convince the other producers that I was the best person to double her, which included a photo shoot of the two of us dressed the same and striking a variety of poses together! All of this gave us the chance to become friendly aside from anything else, so I did have plenty of time with Tessie before arriving on set, and of course that was helpful. LW> Is sword mastering fairly rare for women? How do you think the numbers match up to the men? other it means people remember me! LW> Do you have any other projects coming up for you in the near future? At the moment I am working with Mark Ryan on an independent film he is choreographing and second unit directing, called "The Bacchae." I'm choreographing a bullwhip sequence, in which the man dodging the cracking whip is none other than Bob Chapin. Small world, eh? Roberta poses for stunt coordinator Ricardo Cruz in her Queen of Swords outfit.